Here’s a rundown on how the major networks will be staffing and covering election night 2016, including uses of augmented reality and plenty of data. George Stephanopoulos will lead ABC’s “Your Voice, Your Vote” election night coverage, joined by David Muir, Diane Sawyer and Charles Gibson, from Times Square. Recent hire, Michael Strahan will check the pulse of the outside crowd for reaction as the night unfolds. ABC will also air a special edition of “Nightline” during the overnight hours. “Campaign 2016: Election Night” will begin at 7 p.m. with Scott Pelley, Charlie Rose, Gayle King, Norah O’Donnell, John Dickerson, Elaine Quijano and Bob Schieffer from Studio 57 at the CBS Broadcast Center. At the Decision Desk, CBS News elections director Anthony Salvanto and CBS News correspondent DeMarco Morgan will report on and analyze the races and provide the latest vote tallies and up-to-the-minute exit polling data as the races unfold. Anthony Mason will report from Studio 47, where he will deliver exit polling data on the race using augmented reality graphics, in an effort to explain how and why people voted the way they did. On CBSN, coverage will begin at 6 a.m. with Josh Elliott, Vladimir Duthiers and Reena Ninan. CNN will be live for every part of election day, with its main “Election Night in America” coverage beginning at 4 p.m. Similar to years past, CNN’s Washingon Bureau has been transformed for election day into the CNN Election Center, with Wolf Blitzer, Jake Tapper, Dana Bash and Anderson Cooper leading coverage. John King will be live from the Magic Wall along with CNN political director David Chalian covering exit polls and executive editor of CNN Politics Mark Preston at the decision desk. Tom Foreman will break down the night from CNN’s virtual studio, analyzing Congress and the presidency. Bret Baier and Megyn Kelly will co-anchor “America’s Election Headquarters” with the networks brand new, multi-million dollar studio in New York City, beginning at 6 p.m.
Brit Hume, Chris Wallace, Dana Perino and Juan Williams as well as FNC political contributors Tucker Carlson, Karl Rove and Charles Krauthammer will join the hosts for the night. Broadcasting from 30 Rock, NBC News and MSNBC will again transform Rockefeller Center into Democracy Plaza. Along with lighting its world headquarters in red, white and blue, the networks will use augmented reality technology to show the electoral map live on the skating rink (as compared to physical coverings of the rink in the past). 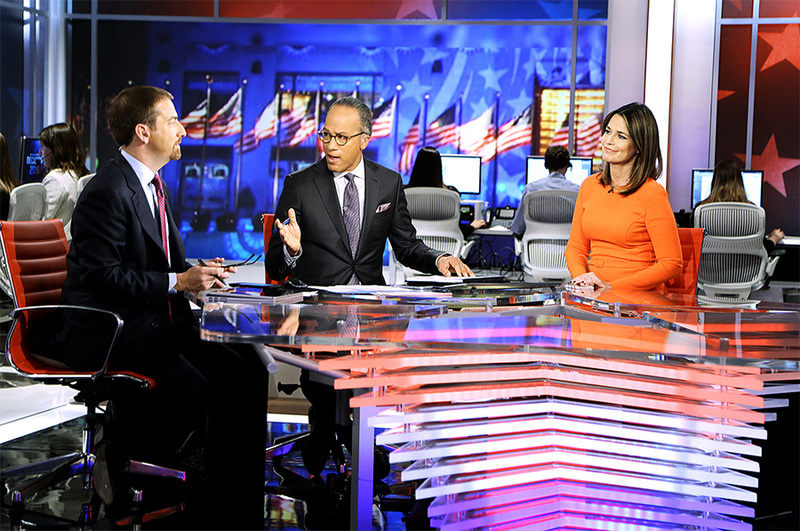 Lester Holt, Savannah Guthrie and Chuck Todd will lead NBC’s coverage, which is slated to air until from 7 p.m. until the wee hours of the night, with Tom Brokaw joining for analysis and historical perspective. Interestingly, NBC has renamed coverage “Decision Night in America,” dropping the year moniker of elections past for its broadcast. MSNBC will feature coverage all-day, with its main team of Rachel Maddow, Brian Williams and Chris Matthews taking the helm at 6 p.m.
Judy Woodruff and Gwen Ifill will anchor PBS’ coverage starting at 8 p.m.
All times listed are in EST.